You may have heard that heat expands to fill in spaces where it may be lacking, which is a great way to understand what happens to the heat in your home throughout the year and the many temperature changes. When it’s hot in the summer you can expect the hot outdoor air to try to make its way into your home. The opposite is true during the winter when the hot air you are paying to heat your home with will naturally try to escape to the colder outdoors. As you can see heat’s movement is a natural process that we as homeowners don’t always agree with and definitely want to control. So what can be done to keep the nice and warm air inside when we want to be warm and outside when we need to cool down? Home insulation is the solution we’re looking for, as it effectively blocks heat from flowing in and out of your home at inopportune times of year! This means with the right insulation you can save money on your heating and air conditioning bills and live more comfortably! While a roofing contractor can provide a temporary solution to your ice damming problem, GeoFurnace Heating & Cooling can prevent future ice dams by sealing air leaks and improving the insulation in your attic. 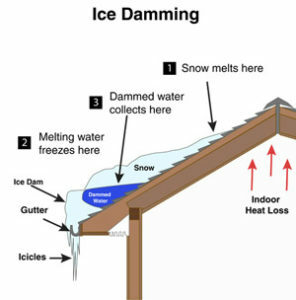 What Causes a Ice Dam?